EdGEO of Canada has worked in partnership with volunteer EdGEO workshop facilitators to compile a digital resource manual containing exciting learning activities relevant to junior and intermediate curricula. 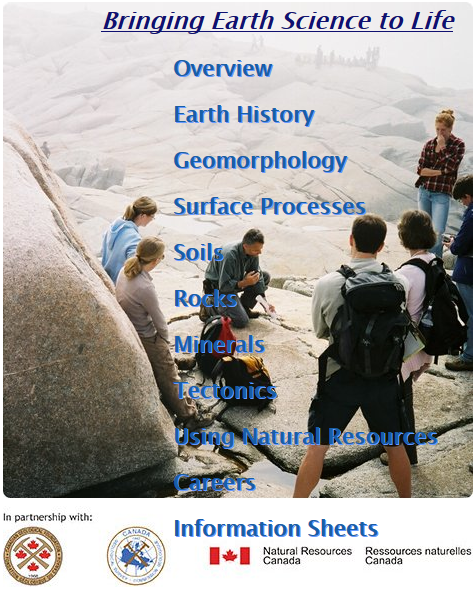 “Bringing Earth Science to Life” features practical hands-on learning activities grouped under the themes of earth history, geomorphology, surface processes, soils, rocks, minerals, tectonics, using natural resources, and careers, along with an overview containing links to online activities, downloadable lesson plans, and additional resources. All of the materials support current teaching methodology that values hands-on experiences where students take an active role in learning. The units can be used as presented or tailored to meet local needs. The resources are available for download as a single ZIP archive or as individual PDF files on the EdGEO website free of charge. By providing educational opportunities for today’s teachers and, through them, their students, EdGEO seeks to cultivate a heightened awareness of our planet. “Bringing Earth Science to Life” is generously funded by Natural Resources Canada. This entry was posted in 500 Pure Science and tagged earth history, earth science, geology, geomorphology, minerals, natural resources, rocks, soils, tectonics. Bookmark the permalink.